Album art is essential to the computer audio experience. It makes our music easier to find, it looks nicer on high resolution screens when we play our favourite music and it makes our library feel more complete. If you use an AURALiC Aries system, which displays artwork prominently in all its high resolution glory, you'll therefore want to make sure artwork for all of your albums is both present in your library, and is of a high enough quality to do it justice. This is where bliss comes in - it can find, download and install missing artwork, and find larger resolution versions of your existing artwork. The AURALiC Aries range of wireless streaming systems have steadily built market share over the past few years amongst audiophiles looking for a way to playback their music library, stored locally or online, via high quality audiophile grade DACs (digital-audio converters). It started with the AURALiC Aries, and has been cemented with the AURALiC Aries Mini, a device that also debuted with an eye-catching low price ( since increased to some controversy). Central to both AURALiC Aries devices is the Lightning DS app. This is the control software for all AURALiC Aries devices and installs on iPads. The Lightning DS app pushes album artwork to the fore; such artwork takes up a significant amount of the app's screen real estate. This means that it's important to have all of your cover art both present and correct; meaning your album artwork must be saved in the correct way, and ideally be large enough to display attractively on the high resolution iPad screen. I'll re-iterate that: your album artwork must be saved in the correct way, and ideally be large enough. Making sure your album artwork is correctly stored and sized are the most important parts of organising the artwork in your library. So, how do the Aries range of music players require artwork is stored and sized? The answer is a little complicated. It depends on how the Aries accesses the music. If the Aries connects to an existing UPnP server on your network, for example, Twonky, LMS or MinimServer, Aries will simply show what it is sent. This means any limitations of the UPnP server with regards album artwork will be passed to the Aries. Artwork must be either embedded or saved to a cover or folder JPG or PNG file. [As above] There's no practical limit on image resolution. So, how do you use bliss to install and fix your album artwork woes? We'll consider both the case of a third party UPnP server being used, and also AURALiC's own Lightning Server. Before doing anything, download and install bliss. First we need to enter the location of our music. If you are using a third party UPnP server, this is the same folder that the UPnP server is pointed at. If you are using Lightning Server, this is the folder that the Lightning Server is watching. If Lightning Server is watching a USB drive, you will need to attach the USB drive to your computer. Then you should point bliss at the music folder within the drive. On Windows, this should show as a named drive, e.g. "Y:\". On OS X, the folder should appear under /Volumes. We can now set the Aries album art rules. If you are using a third party UPnP server, you will have to defer to rules specific to your server at this point. So the default Saved artwork filename of cover is fine. However, especially if you are using a Windows computer, you may want to change that to folder. After filling in missing artwork, it might be best to also increase the minimum size to something like 500x500 to ensure all artwork is of a sufficient resolution to display adequately in Lightning DS. But leave that free for now; we can always change that on a second run. Now click Apply rules and bliss will begin assessing and fixing your artwork! 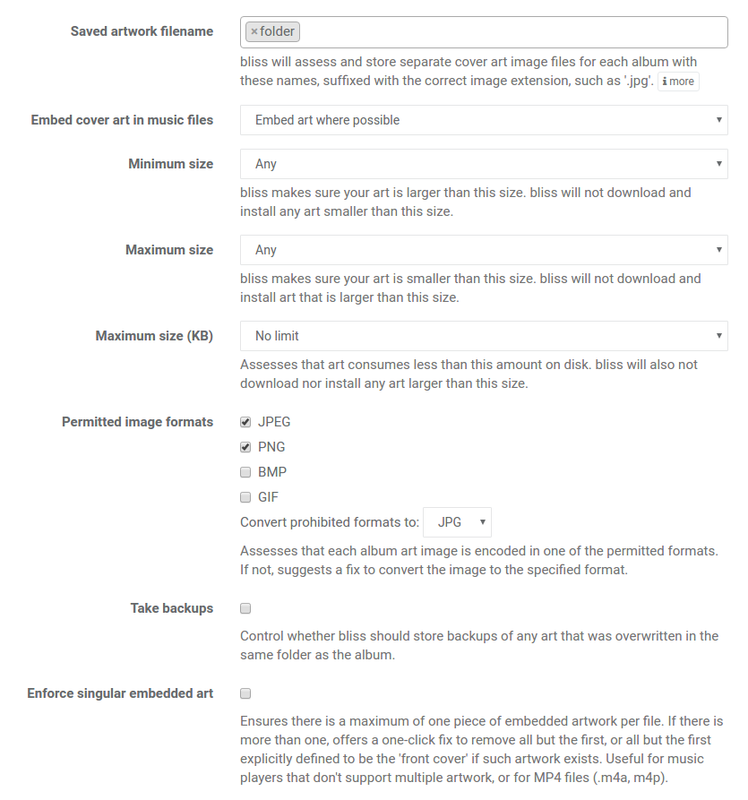 If bliss finds an album without a folder.jpg nor embedded art, it will find artwork online and install it, embedding and saving to folder.jpg (unless you decided not to embed). The original albums that already had artwork (bliss does not touch these). Albums that were missing artwork, which bliss has automatically added artwork for. Non-compliant albums that are still missing artwork. That last group is there because finding cover art online is not always 100% accurate. 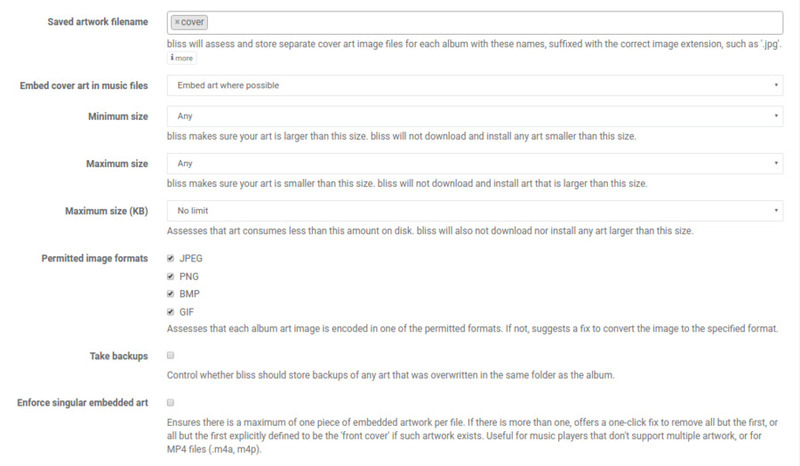 As a result, during its automatic scan, bliss is pretty conservative about what artwork it downloads and installs. You can then scroll through your final albums, line by line, choosing artwork for them. Once we're done, that's all the artwork stored in your music library. Now it's time to tell Lightning DS that the artwork has been added, so you can see it in the app! The Lightning DS app caches artwork on the device, to make sure it is displayed zippily when you browse your music collection. If you change the music files in your collection, adding or replacing album artwork, you need to refresh this cache. The first thing to try is, in the Lightning DS app, choose Settings > Music Library > [choose your UPnP server] > Refresh Cache. If that doesn't work, and you are using the embedded UPnP server, then you can try rescanning it. 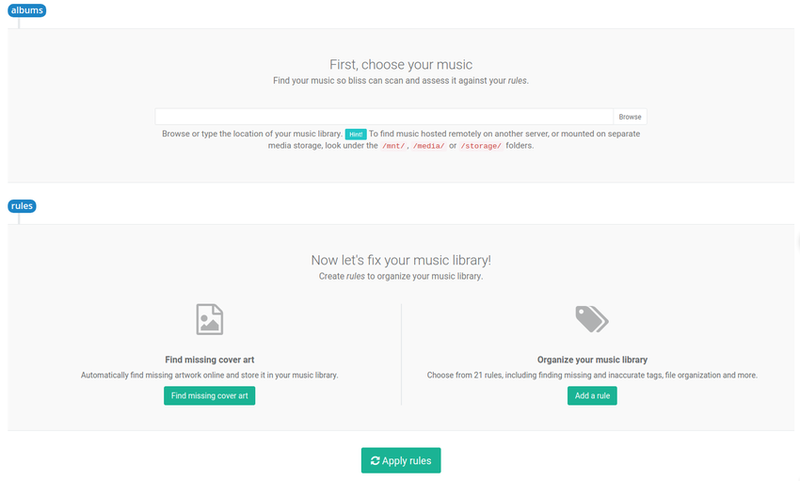 Choose Settings > Music Library > LightningServer) > Rescan. After a brief period the music library should be rescanned, and your new album artwork should appear. I hope this helps you collect more high resolution album art for your AURALiC Aries device!